Just across the street from the London Natural History Museum is B-P House. 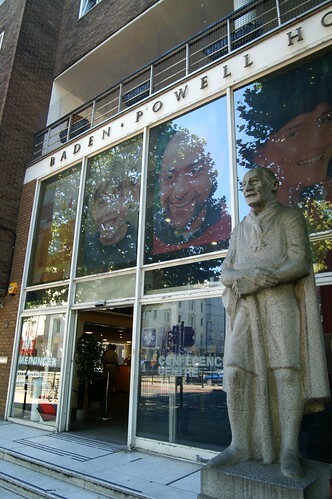 The Baden-Powell House is a hostel and conference center and it happens to have a statue right out front of Lord Baden-Powell, the father of the scouting movement. The statue is said to be the only granite statue in London and is about 10 feet tall (3 meters). There isn't much to see other than the statue; there is a small gift shop and a few mementos are inside B-P House. But if you were ever a scout it is a great photo opportunity while in the area. Scouters really wanting to see something of the scout movement would need to go out to Gilwell Park about 17 miles (27.3 km) north of London. If you wanted to stay at the hostel, it starts at £22 per person. A hostel isn't like a hotel room; you will get to bunk with others. This may be different than you are accustom to but also may give you a unique fun experience. Children under 5 stay free. Even so with a family it may be cheaper and more comfortable to stay elsewhere.